Ahead of the European elections, Euronews is taking a road trip across 14 EU countries to hear from people on the issues they care about. After travelling through Spain for the past few days, our road trip team is now in Barcelona, after a weekend of violence. 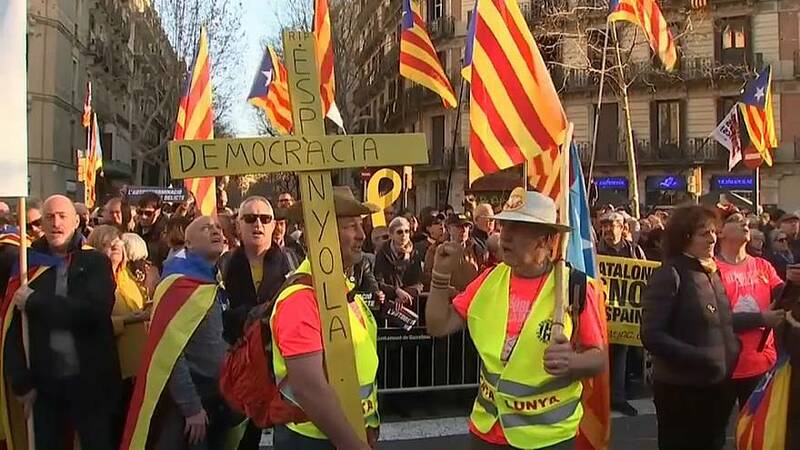 On Saturday, Catalan separatists clashed with activists from newly-formed far-right group Vox, amid rising political tensions between the two groups. Barcelona has become a symbol of one of Spain's most divisive political issues – Catalan independence. Twelve Catalan leaders are facing charges of rebellion, and others have fled Spain, after they launched a failed independence bid in 2017. But, support for the movement has not dwindled. Our correspondent Anelise Borges set up Euronews' red couch in Barcelona and asked Catalans about a topic that has dominated Spanish political discourse. Luis Amoros said that he believes the situation can be resolved. "The two sides made many mistakes. This is not about who’s right and who’s wrong. They should sit down to discuss the issues," he said. However, others are more passionate, and believe that Catalonia will eventually gain its independence. "We are worried because there is no justice, there is no democracy. This is about democracy. And we do not see how to get out of it," said Mariona Gracia Alstals. "We are of another way of being, we are walking with the pressure of having to be Spain but we are not Spain. We are Catalonia. "I am convinced that we will win. Now this is irreversible - there is no turning back." The question of independence has been an ongoing and divisive issue, separating Catalans into two groups. "I know two sisters - one is in favour the other against the independence movement - and when they go to their mother's house they cannot talk about it," said Isabel Platas. "I respect all cultures, but I think these are ideas outside of our days. On the contrary, the most important thing is globalisation, and these thoughts are completely opposed – to close oneself to the world?" Spanish election: Who are the candidates and what do they stand for?